Well, then. Osprey is not at all shy about warning away those uninitiated into the gram-obsessed club from their brand new, much-hyped pair of super-duper lightweight backpacking packs, the Levity (men’s) ($250) and Lumina (women’s). “It’s probably not the right pack for you,” the company says right there in the description of the pack on their website. An unusual marketing strategy, but also, pretty good advice, actually. Even if it does sound like a challenge. At the you’ve-got-to-be-kidding-me weight of only 1.8 pounds for the 45-liter version, the Levity has been stripped of most features and goodies workaday backpackers take for granted, all in the quest to go sub-two-pounds. There are no hipbelt pockets (you won’t miss these, promise), only one zippered pocket on the lid, no ice ax loops, no trekking pole attachments. It’s as minimalist a pack as you’ll find from a major manufacturer. So minimalist in fact, Osprey recommends the pack only for load ranges up to 20 pounds. That’s a tall order for lots of backpackers, but if you’ve invested in ultralight gear, it’s not so bad at all. It also means the pack excels as a daypack—lighter than most, easy to carry. It’s one of the few packs small enough to double-duty as day and overnight pack. Fairly typical gear list for two-three day trip in the Sierra, including bear can. Bag, stuffed with everything above. To get there, Osprey uses a 30d silnylon body, an incredibly lightweight (and potentially fragile) material for a backpack. The areas likely to get the most abuse, however—the bottom, top lid, side pockets, and large front pocket—are made with a 210d proprietary nylon Osprey calls “NanoFly.” It’s much stronger than the rest of the pack and sheds water very well. Compared to, say the outer mesh pockets on Osprey’s Exos, previously the lightest pack they made, NanoFly is much less likely to rip and protects your precious contents from light precip. They’ve also cut down on the padding in the suspension system. The Levity uses the same terrific AirSpeed trampoline-style backpanel and lightweight frame as the Exos, but the shoulder straps and hipbelt padding on the Levity are roughly half what the Exos uses. But this makes total sense for a pack expected to carry something like half the weight of the Exos. To further shed weight, the Levity uses light compression cords, rather than fabric straps, that are actually removable. These, I really don’t like. They’re not as intuitive and easy to use as fabric straps, and though you get the hang of them quickly enough, I can’t imagine the weight savings are worth having to fiddle with thin, dangly cords. I’d probably yank these suckers out of the pack before a multi-day trip when I won’t likely need to cinch the body down much anyway. The light, stretchy hipbelt doesn’t offer a lot of padding, but the flexibility provides support and comfort. The ventilated AirSpeed suspension system: still the most breathable we’ve tested. Everything adds up to a pack built with one purpose in mind: allowing, nay, forcing the user to go lighter and far more minimalist in their packing. Some would even say smarter; actually, Osprey themselves say that in their own description of the Levity. 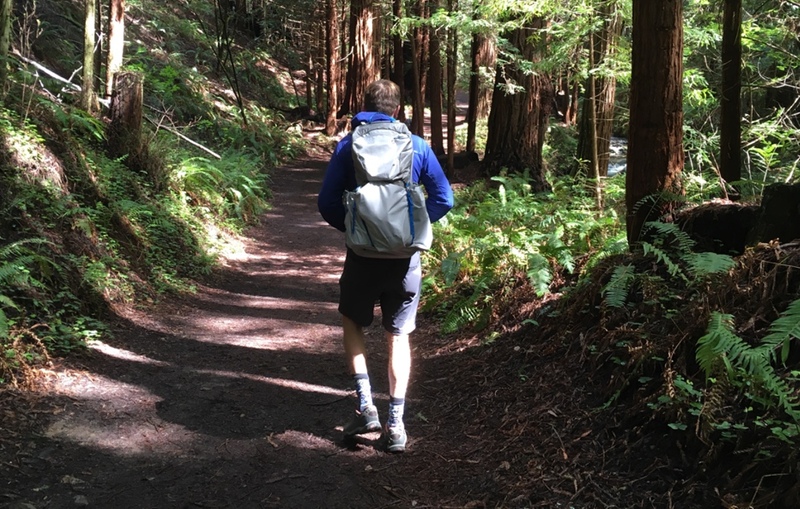 If you can get your pack weight down to the 20-pound range, roughly what I carry on a solo trip, the Levity is a phenomenally comfortable pack. We’ve only had our hands on one for a bit more than a week, so we’ve yet to use it on any multi-day trips, but packing it full of the contents I’d normally bring on a three-night trip, I’ve put at least 50 miles on the pack and it’s incredibly comfortable, stable, and breathable. Gripes, sure, I’ve got a few. The frame and suspension wrap around your body to the point that it’s hard to properly stuff the bottom of the pack. There are little corners that are difficult to access, and it feels like there might be wasted space down there when the pack is filled to the gills. Plus, no matter how you pack it, this pack won’t stand up straight when set down. A small complaint, but still, it’s nice not to lay a pack down straight onto dirt or wet vegetation. All in all, so far I’d agree with Osprey. This pack is not for everybody. It’s certainly not for most backpackers. But it’s a very well-made and compelling option for superlight packers who value comfort. We’ll get it out on a few longer trips soon and report back.